NEW YORK/BENGALURU (April 16): Wall Street dipped on Friday as oil price declines weighed on energy shares and Apple dragged on the market, but major indexes still posted gains for the week. Energy was the worst performing sector, ending down 1.3 percent. Oil prices fell as traders and analysts anticipate a weekend meeting of major oil exporters will do little to clear global oversupply quickly. Apple shares dropped 2 percent, the biggest drag on the S&P 500 and Nasdaq. The Nikkei business daily reported that the company will continue its reduced production of iPhones in light of sluggish sales. Citigroup shares closed down 0.1 percent after the company reported a sharp drop in quarterly profit, capping a big week of bank earnings. Financial shares, the worst performing sector this year, fell 0.3 percent and snapped a five-session winning streak. Despite Friday's declines, the major indexes tallied their seventh week of gains out of the past nine. The recent run is "giving investors pause, wondering if there's going to be a little pullback at some point," said Jim Paulsen, chief investment strategist at Wells Capital Management in Minneapolis. "You take in the fact of oil dropping a fair amount here today ... that's giving people pause. Oil is still an important contributor here to expectations within the stock market." 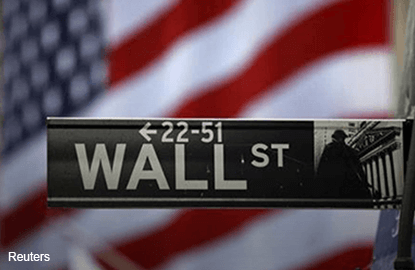 The Dow Jones industrial average fell 28.97 points, or 0.16 percent, to 17,897.46, the S&P 500 lost 2.05 points, or 0.1 percent, to 2,080.73 and the Nasdaq Composite dropped 7.67 points, or 0.16 percent, to 4,938.22. Six of the 10 S&P sectors finished in positive territory, helping limit the overall declines, led by a 0.7 percent gain for utilities, the best performing sector of 2016 so far. Wall Street's rough start to 2016, amid concerns over the global economy, was followed by a sharp rebound starting in mid-February. Stocks have steadied in April and the S&P 500 is now positive for 2016. Investors have turned their attention to earnings season, which will intensify next week, as the next major factor influencing the market. First-quarter profits among S&P 500 companies are expected to have fallen 7.8 percent, according to Thomson Reuters I/B/E/S, but the diminished expectations could offer a silver lining for stocks if companies outperform. "We have already seen the banks surprise on the upside pretty much here, and I think we are likely to see other companies actually surprise on the upside because there is such pessimism about first-quarter earnings," said Tim Ghriskey, chief investment officer of Solaris Asset Management in New York. Shares of BATS Global Markets jumped 21.1 percent to $23 after the exchange operator went public, the first non-healthcare IPO of 2016. About 6.6 billion shares changed hands on U.S. exchanges, below the 7 billion daily average for the past 20 trading days, according to Thomson Reuters data. NYSE advancing issues outnumbered decliners 1,606 to 1,401, for a 1.15-to-1 ratio on the upside; on the Nasdaq, 1,438 issues fell and 1,382 advanced for a 1.04-to-1 ratio favoring decliners. The S&P 500 posted 9 new 52-week highs and 2 lows; the Nasdaq recorded 55 new highs and 18 lows.